Discourage your dog from leash pulling with the PetSafe Easy Walk No-Pull Harness for Dogs. Easy to fit and comfortable to wear, the adjustable Easy Walk No-Pull Dog Harness makes outdoor walks more enjoyable for you and your furry friend. 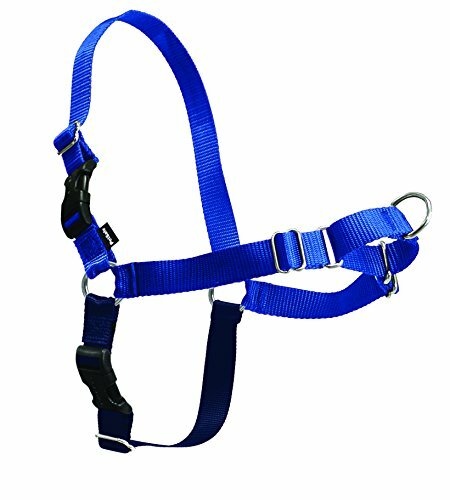 The harness features a front chest leash attachment to help steer your dog and redirect his attention back to you if he starts to pull. The harness straps rest across your dog’s chest and belly-not the delicate throat area-so there is no choking, gagging or coughing if your pet tries to pull Finding the perfect size for your pooch is quick and easy by measuring the width of your dog’s chest (including one inch behind the front legs) while standing and then wrapping your measuring tape around your dog’s body to find the girth measurement. To view how to measure your pet, please refer to the 30 second video. When you have your dog’s measurements, using the sizing chart near the top of the page to find the size your dog wears. Please know the sizing chart on the product packaging may not match the size chart near the top of the page. For the most up-to-date sizing info, please refer to the sizing chart near the top of the page. If you have any questions about measuring your dog, please contact PetSafe Customer Care at 1-800-845-3274 and we’ll be happy to assist you!